Pups are individually priced after they are born and old enough to be evaluated. 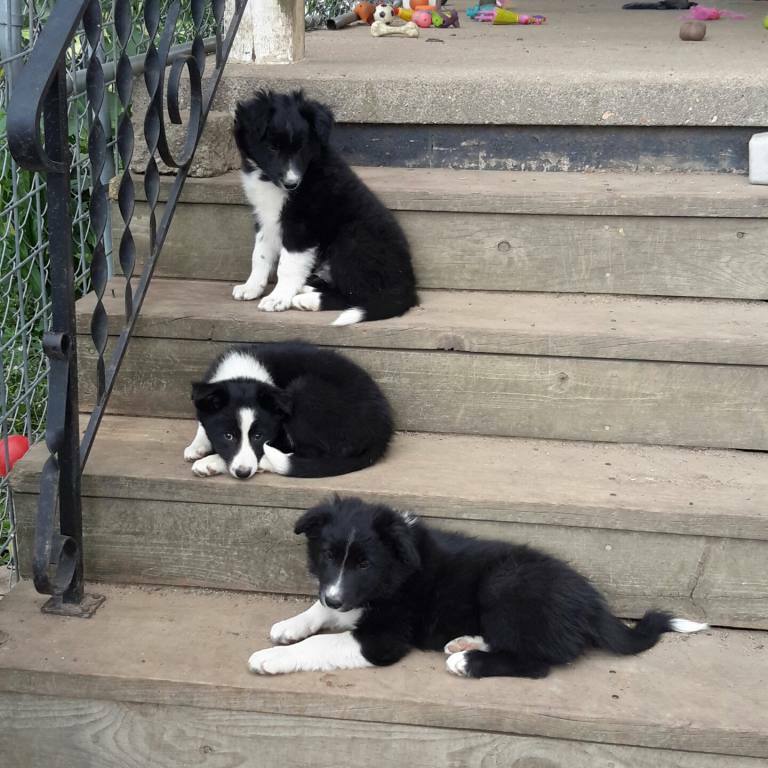 Breeding stock potential (male or female) $1500.00 and sold only to qualified and experienced Border Collie Enthusiast agreeing to our terms, conditions and high standards of maintaining and or improving upon top quality genetic bloodlines. Pet quality pup from proven parents (male or female) $900.00 - $1200.00 based on bloodline. Sold with a spay/nueter agreement. Definition of Pick of the Litter. A puppy that is chosen over the rest of the litter by either the breeder or by request of applicant, for having outstanding or special qualities that stands out from the rest of the litter. Or in some cases, pick of the litter is chosen by the 1st qualified applicant that reserves a pup and requests to be first to choose a puppy from the litter before anyone else does. Definition of a Breeding Stock Potential Pup; A good quality pup that is the offspring of 2 top quality parents that have been proven to be good working dogs. The pups parents are physically sound and have a good pedigree. The breeding stock potential pup will be chosen for having outstanding physical and personality traits that would be considered desirable for maintaining and or improving the gene pool of the working Border Collie breed. Breeding stock potential pups are only sold to knowledgeable Border Collie enthusiasts that are able and willing to prove the dog worthy of producing a litter and willing to work with us on the terms for a potential mate. Definition of Pet Quality Pup; Any healthy good quality pup sold for pet purposes only. This pup is sold to a pre screened good home with a full pedigree and a spay/neuter agreement. This pup cannot be used for future breeding regardless of future accomplishments, pedigree or personality. Definition of Pet Quality Pup with a non life threatening birth defect; A healthy pup that was born less than perfect. This pup will be sold or placed with a spay/neuter agreement and may or may not be registered depending on condition. Please note that we only place healthy pups in new homes. We request that you fill out our Border Collie Placement Application if you are interested in purchasing one of our Border Collies. All applicants will be reviewed and considered. We reserve the right to be selective on how we place our Border Collies.